There is a great article by Todd Johnson that helps put some numbers to the tremendous global shifts that are taking place in Christianity worldwide. It is "Christianity in Global Context: Trends and Statistics." We simply must take stock of the fact that Christianity is not a western religion. But it also means more, because it means we must begin to look at how our theological resources in the west can be brought to bear on the questions being asked by Majority world Christians. While the questions may seem strange to us, or perhaps resolved or unimportant, they are issues of importance to our fellow Christians in other parts of the world. Twenty-five years ago I remember leading a home Bible study in a low-income barrio of Guatemala City. The topic of discussion, which I didn't even plan on addressing that evening, revolved around the eternal destiny of the Mayan descendants of our hosts! Was it true that God simply condemned them to eternal punishment because it took so long for the Christian message to reach Mesoamerica? While we may be able to provide answers, doing so in a way that takes seriously the perspectives of relatively new Christians is a challenge. Mark Noll mentions the same question in his new book, The New Shape of World Christianity. I guess it's never been such a pressing question for me. After all, my family has been Christian for generations. Bohemia has been evangelized since the martyrdom of Prince Wenceslaus in 929, and Germany even earlier. But newer Christians are asking different questions than we might be asking. Another factor that shapes the kinds of questions newer Christians in the Majority world are asking is the struggle to just get by day-by-day that they are experiencing. In many cases, Majority world Christians are struggling just to survive. To a hungry man, or a sick woman with no medical help available, the question of God's immanent involvement with our world is of pressing importance. If God can act, why not ask him to and expect him to, even in surprising ways? It's not that we don't have answers to these kinds of questions; it's just that we sometimes find other questions more fascinating. Once I have finished Noll's book, I'll post a short review. 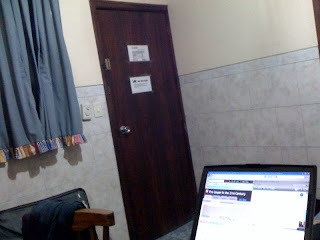 This is being written from a little hotel room near the international airport in Caracas, Venezuela. This past week I had the privilege of teaching a course on homiletics to a group of about 20 enthusiastic students, young and old. 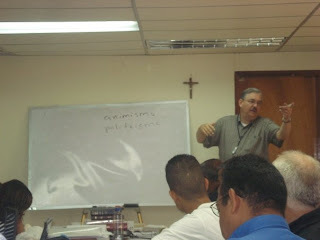 The first time I visited Venezuela was 13 years ago, when I was here for a course on Pastoral Theology. For some reason my introductory lesson in which I mentioned Luther's comments on the making of a theologian--Oratio, Medi tatio, Tentatio--really resonated with the participants then--some of the more seasoned pastors from that day and age reminded me of that this year too! Oh, let me get this over with right from the start: Hugo Chavez says hi to all of you. I can't count how many people ask me to greet him or asked about how he is doing as I prepared for this trip. The Lutheran Church in Venezuela is a small but committed group of Lutheran Christians who are very enthusiastic and hard-working. Their love for God's word and the sacrifices they are willing to make for the sake of the gospel is inspirational. I was thinking about the spread of Christianity around the world, especially in terms of the idea that Christianity is often considered a "western religion." I've often begun my presentations on missions in Latin America by asking where the first Lutheran church in the Americas was founded. One time a young lady argued with me vigorously that it was Perry County, Missouri. That wasn't even close. My home church in Fort Wayne, Indiana--St. Paul--was founded before those guys from Dresden even set sail for Missouri. I only ask that question to point out how much we have allowed ourselves to believe that the United States is the center of the universe. Actually, there is some evidence that the first Lutheran Church was founded in Maracaibo, Venezuela. In fact, it is often stated that the first Lutheran (and protestant) church was founded in the 1530s when Charles V, in need of funds, gave the right to explore the region of Venezuela to the Welser family. There is little evidence that they established a Lutheran church in Maracaibo, Venezuela, as has been asserted by some, or that the Welsers were even Lutheran. However, even if they were Lutheran and had established a Lutheran church, today there remains no remnant of that church. If it was established, it survived only a short time since the activities of the Welsers in Venezuela lasted only a few years (1538-1546). "David, I know I’ve asked you about this before. I ran across the following statement: “The fathers of both the governor of the colony, Ambrosio Alfinger, and the Vice-governor, Nicolás Federmann, signed the Augsburg Confession.” Do you know of anything that backs that statement up? Thanks. Doug"
Thanks for your query about these two representatives of the Welser Bank who governed a part of Venezuela in the 1520s and 1530s. I checked my notes for my course on the history of the church in Latin America, and I do have a reference from Pablo Alberto Deirós, Historia del cristianismo en América Latina (Buenos Aires: Facultad Teológica Latinoamericana, 1992), page 592, that Federmann’s father (he doesn’t mention Alfinger’s father) signed the Augsburg Confession. Of course, when one looks up the signers of the Augsburg Confession in the Book of Concord, one only finds the names of seven noblemen and the mayors and councils of Nuremberg and Reutlingen. On the other hand, I’m pretty sure that by 1530 there were a lot of other cities in Germany that supported the theology of the Augsburg Confession, as we can ascertain by reading Bernd Moeller’s and Steven Ozment’s monographs on the Reformation in the cities, and my notes also indicate that Alfinger and Federmann were from the city of Ulm, which supported the Lutheran Reformation. So, there must have been a way for these other German cities to show their support for the Augsburg Confession, and, who knows, the fathers of Federmann and Alfinger may have been members of the municipal council of Ulm who had ushered in the Reformation in their city. a) In 1528 the Spanish government made a contract with two Germans, Heinrich Ynger and Hieronymus Sayler, authorizing them to pacify the area from Maracaibo to Puerto La Cruz. According to the contract, the Germans would also colonize the area and take fifty German miners there in case precious metals were found. b) In 1529 Ambrosius Alfinger, Ynger’s brother, landed in Coro with seven hundred men and eighty horses. c) In 1530, while the Diet of Augsburg at which the Confession was presented was in session, Ynger and Sayler transferred the rights they had over the Venezuelan territories to Anton and Bartholomäus Welser, owners of the noted international bank that also by that time had interests in India, and thus apparently were in business with the Portuguese. The headquarters of the Welser were in Augsburg, and my impression is that the Welser, unlike the other great German banking family, the Fugger, sympathized with the Reformation. a) Charles V and his successors in Spain were about to embark on a vicious circle of indebtedness to foreign bankers that would lead to repeated bankruptcies of the Spanish government. Was he already becoming dependent on loans from the Welser, and did such a factor affect his attitude towards the pro-Lutheran electors at the diet? b) During the early 1530s a number of Germans and Flemish people settled in the Spanish colonies in America (not just in Venezuela) before the Concejo de las Indias restricted free entry of these ethnic groups into the American colonies in 1535. Hence the appearance in the inquisitorial records of people with names like Andrés Alemán. It's an interesting thought, to be sure. It's hard to say how much the gospel might have infuenced these German adventurers. Did they really bring the cross with their sword, as the Catholic conquerers did. There really is a lot to learn from the history of Christianity in Latin America. In our seminaries it seems we only hear a part of the story. Soon I'll present some interesting "suggested reading" on the history of Christianity that helps us understand Christianity as a global phenomenon rather than focusing almost entirely on Northern Europe and North America. Another interesting point that Dr. Coles makes is his reference to Charles V embarking on a "vicious circle of endebtedness." Sound familiar? Until next time! I've got to try to get some sleep before my 2:30 a.m. wakeup call.